Our project at John R. Good Elementary School in Irving, TX was at "Cheryl's Garden of Learning." We weeded and generally cleaned up for a new school year. An old picnic table and bench were broken down and disposed of and will soon be replaced in the near future thanks to the generous contributions from several of our local alums. 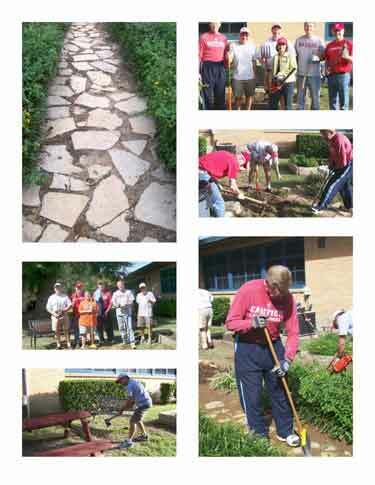 Flower beds were treated with mulch, new flowers were planted, and decomposed granite was spread on the major walkway. Participating alums were as follows, in order of "experience:"
Jim Thomas '73 (a recent transplant from St. Louis). Jim's wife Lynn also participated, and my wife Jensy supervised the whole affair (she teaches kindergarten at John R. Good and teaches enrichment classes concerning the garden to economically-disadvantaged children). Afterwards, Jensy and I treated the group to lunch at a local Mexican restaurant. We had a great time.